Captain Steven Davis scored in a 1-0 win against Latvia to kick off their Euro 2016 preparations. 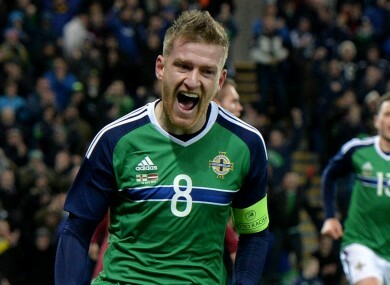 STEVEN DAVIS SCORED the winner to give Northern Ireland their first friendly victory since March 2008, beating Latvia 1-0 at Windsor Park on Friday. In front of a celebratory crowd, captain Davis beat Latvia goalkeeper Andris Vanins at the second attempt early in the second half to notch his third international goal of 2015 and settle the match. Northern Ireland, preparing for their first major tournament appearance since 1986 after topping Euro 2016 qualifying Group F, were testing a new 3-5-2 formation with Jamie Ward partnering Kyle Lafferty up front. Lafferty was substituted shortly after the break after hurting his ribs but he had the best chance of the first half when he shot wide with Ward in a good position. A raft of substitutions took the sting out of the game and the tempo dropped as the match went on, with few openings for Northern Ireland to extend their lead, while Latvia offered very little. Michael O’Neill’s side are now unbeaten in eight matches and have won five of their seven meetings against Latvia. Northern Ireland started confidently with Stuart Dallas firing over from 20 yards before Ward tested Vanins with a swerving effort from outside the box. The hosts were dominating possession at a sold out Windsor Park and Vanins again saved from Ward on 14 minutes following a cutting move. Latvia, 70 places below Northern Ireland in the FIFA rankings, were showing little ambition in attack but proved tough to break down, demonstrating the determined defensive skills that had helped them to record four successive away draws. Davis had a fine chance to open the scoring on the half-hour mark but he could not get enough on his shot to beat Vanins. Moments later Kyle Lafferty fired wide of the far post when Ward was available for a square ball that would have given him a tap in. Shortly before half-time Jonny Evans dived to head a deflected Oliver Norwood free-kick just wide. Latvia played themselves into trouble five minutes after the break and Lafferty held off two defenders before unleashing a fierce left-footed shot, but Vanins was again equal to the effort. But the home side were soon in front. A long ball from Craig Cathcart found Southampton midfielder Davis behind the Latvia defence and although Vanins saved his header, the rebound was tucked away neatly by the Northern Ireland skipper. Davis almost doubled his tally for the night when he connected well with a volley from 20 yards, but Vanins saved easily. Latvia’s substitute goalkeeper Pavels Steinbors ensured it finished 1-0 after Shane Ferguson’s persistence caused chaos and Vitalijs Jagodinskis nearly diverted into his own goal. Artjoms Rudnevs could have equalised at the death but he fired wide on his first appearance for Latvia in nearly a year. Email “Northern Ireland win their first friendly in over 7 years”. Feedback on “Northern Ireland win their first friendly in over 7 years”.